Xylem WE1512HH Goulds Pump. WE1512HH 3885 WE Series Submersible Effluent Pump. 1 1/2 HP, 230 Volt, 60 Hz, 5.5″ Impeller, 2″ NPT Discharge, 20′ Cord, 3/4″ Solids. 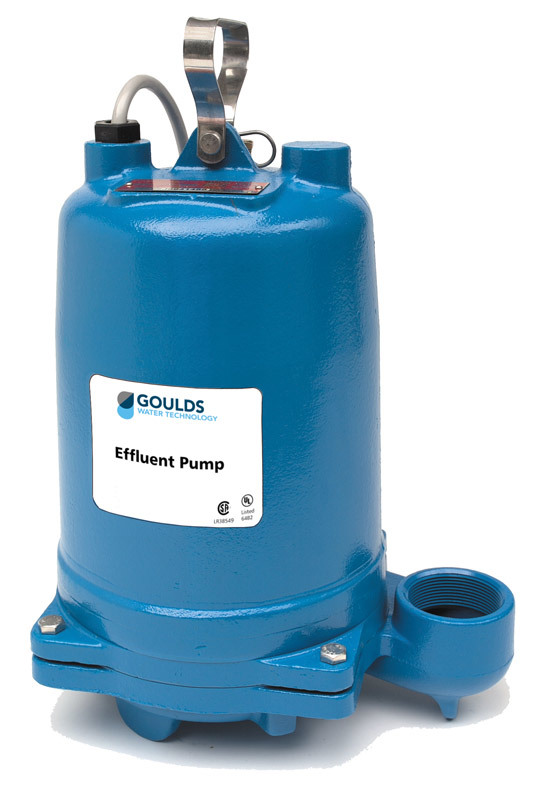 We are an authorized Goulds Distributor. Pumps Purchased from us come complete with manufacturer warranty. Impeller – Cast iron, semi-open, non-clog with pump-out vanes for mechanical seal protection. Balanced for smooth operation. Silicon bronze impeller available as an option. Casing – Cast iron volute type for maximum efficiency. 2″ NPT discharge. Mechanical Seal – Silicon Carbide vs. Silicon Carbide sealing faces. Stainless steel metal parts, BUNA-N elastomers. Shaft – Corrosion-resistant, stainless steel. Threaded design. Locknut on all models. Guards against component damage on accidental reverse rotation. Fasteners – 300 series stainless steel. Capable of running dry without damage to components. Designed for continuous operation when fully submerged. Specifically designed for the following uses, Homes, Farms, Trailer Courts, Motels, Schools, Hospitals, Industry, Effluent Systems. Solids handling capabilities -3?4″ maximum. Capacities – up to 140 GPM. Total heads – up to 128 feet TDH. Temperature – 104°F (40°C) continuous, 140°F (60°C) intermittent. See order numbers on reverse side for specific HP, voltage, phase and RPMs available. Fully submerged in high-grade turbine oil for lubrication and efficient heat transfer. Class B insulation on 1?3  1½ HP models. Class F insulation on 2 HP models. Capacitor start motors for maximum starting torque. Built-in overload with automatic reset. SJTOW or STOW severe duty oil and water resistant power cords. 1?3  1 HP models have NEMA three prong grounding plugs. 1½ HP and larger units have bare lead cord ends. Class 10 overload protection must be provided in separately ordered starter unit. STOW power cords all have bare lead cord ends. Designed for Continuous Operation. Pump ratings are within the motor manufacturer’s recommended working limits. Consequently in addition, can be operated continuously with-out damage when fully submerged. Bearings – Upper and lower heavy duty ball bearing construction. Power Cable – Severe duty rated, oil and water resistant. Epoxy seal on motor end provides secondary moisture barrier in case of outer jacket damage. Also to prevent oil wicking. Standard cord is 20′. Optional lengths are available. O-ring -Assures positive sealing against contaminants and oil leakage.